The issue of an East London mega-mosque is in the news again. 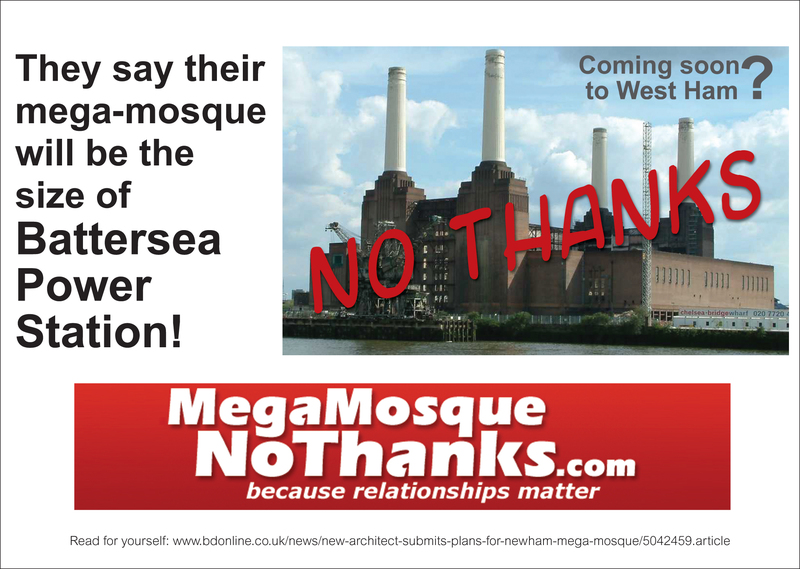 It is said the proposed mosque in West Ham will be as large as Battersea Power Station. As in the past, the redoubtable Alan Craig is leading the charge against the mosque. He sent out the press release below early this morning. Local residents and volunteers have launched their campaign against the proposed mega-mosque at West Ham, close to the Olympic Park in east London. 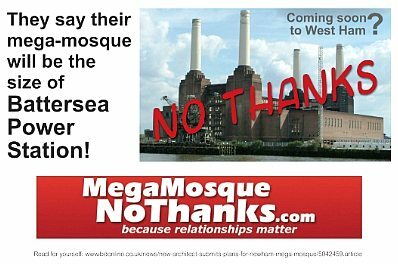 The controversial fundamentalist group Tablighi Jamaat last month lodged with Newham Council their plans for the mosque which, their designer NRAP Architects claimed, will be “the size of Battersea Power Station”. It is planned to have a capacity of 9,350, a dining hall for 2,000 worshippers, residential accommodation for Imams and mosque visitors and a large Islamic library. The opposition group MegaMosqueNoThanks has taken half-page adverts in the Newham Recorder to inform locals (see image above) and this morning volunteers commence leafleting commuters at West Ham station and homes across local area. They are also working with a team of planners and lawyers to oppose the planning application. “The sheer size of the mosque betrays the ambition and arrogance of Tablighi Jamaat,” said MegaMosqueNoThanks campaign director Alan Craig who lives with his family a mile from the site. “Their religious ideology is divisive and hostile to non-Muslims, and there is certainly no local demand for something of this magnitude. 1. The image (above) is available in high resolution. Where is all the money coming from for the building of all these gigantic monstrosities? I presume it's either saudi arabia or iran? Certainly being funded by foreigners. Is there no law to prevent them from such interference in the infrastructure of our country? Where do they need a large library for? A Canadian Sufi did some research a few years back and found out that over 80% of the Mosques in Canada and the U.S. get their construction funding from Saudi Arabia and their Imans who are trained and funded by the Saudis teach Salafist theology. It stands to reason it's no different in Britain, especially with a high profile West Ham abomination. your nations are been taken over like you did Africa and parts of the middle East. colonization isnt fun is it? I always thought that Saudi Arabia was funding the building of mosques in Britain. Didn't Cameron recently go and grovel there. I don't think he mentioned the subject of the way Christians are treated in Saudi, funny that. Also, didn't I read on your site that a Saudi billionaire funded Obama's study at Harvard Law School. Could be him then. I think they should wait until the Marxists have so de-Christianised Britain that St Paul's Cathedral comes up for sale. They would only need to add a few minarets like the Hagia Sophis in Constantinople. I am sure that Cameron would back the planning application in the name of cementing community relations. Wasn't it the Norwegians who said no to a Saudi-funded Islamic centre because the Saudis won't let churches be built in their country? That'd be a way to go. West Ham! I wonder how long it will take to rename that borough? I notice it is conveniently located near three major roads. Cool! So we can string up a giant inflatable pig between the minarets? Anonymous said... 4 your nations are been taken over like you did Africa and parts of the middle East. colonization isnt fun is it? But the Muslims had been attacking the Christian world for centuries before the Christian world colonized America and Africa. Also, the Muslims colonized Africa and South-Asia as well. If you have a religion that requires large families, you should understand that large families have no other choice than to colonize. Christianity is still hypocritical about this. But Muslims cannot criticize the West for BOTH colonization AND being promiscuous/having small families. It is one or the other. I managed to get the URL for Alan's blog by clicking on the photo in your article which gave me the source. I am now informing all my mailing list about this abomination. Why didn't you include a simple link in your article ? A simple reason: it wasn't included in the email with the press release. I found the image separately through a google search. Not knowing for certain that he wanted a link to that site included, I linked the image only. There is an On-line petition that's just started out via directgov in the U.K., which is the reason why Tablighi Jamaat were stopped in their tracks the last time that they attempted to build this London Mega Mosque, as it raised nearly three hundred thousand signatures. Can I please urge everybody in Britain to get involved with this again, by sending it around. Thanks. 1930s when London was a vibrant and exciting monocultural cockney city could see what was going on in London today they would be chucking themselves off the roof. Interesting comment about even the Norwegians insisting that Saudi not be allowed to fund mosques there because of the treatment of Christians in Saudi. As I have already commented, don't expect the same from slippery Dave Cameron and the rest of our government of grovelling appeasers. None of them mentioned the fate of Christians there when visiting Saudi Arabia recently. I have just read an interesting comment by a chap called, I think, Paul Gould, about the state of politics in Britain. He said politicians are like footballers playing to an empty stadium. Potential voters have just lost interest in the game and gone home. How true, how true. When they are mud sligging in the Houses of Parliament they think we care. We don't give a damn. We look on them all with utter contempt. Perhaps it's time for the Brits to stock up on slabs of bacon and just drench the proposed Mosque site with bacon. May let a few hogs run wild. Or perhaps make hog walking a new pastime. Make the hog a national pet and symbol of good food & fashion. Promote pig leather pants, shoes, skirts, etc. Norway has oil, and England lacks oil. Columnist, I don’t agree with the comment from Anonymous re ‘’colonization isnt fun is it? Nor your comment expressing understanding for it, although you subsequently dealt with Anonymous in a suitable way. As I see it, the only way such ignorant comments could be seen as understandable sentiments are when your sentiment lean towards ignoring or excusing the past history of Islamic invasion and colonisation, while singularly condemning the west for their limited contribution. Anonymous may be ignorant of the fact that Western colonialism was temporary, that independence was granted, and unlike Islamic colonisation,didn’t set about deliberately destroying the existing culture in those countries to replace them with a monolithic oppressive Islamic culture. Western colonists were generally few in number and didn't engage in population replacement or operate a supremacist mindset where lands once conquered by the West remained forever the property of the West unlike Islamic colonialism. Did the west take advantage and exploit others in the past? Certainly, and we have paid over and over again in aid and other assistance, and still haven’t been allowed to forget it, expected to to feel guilty forever for the sins of our fathers. Islam however receives different treatment. Did Islam invade, colonise, and destroy the cultures of a vastly greater number of countries and civilisations than the West ever did? You bet it did, and islamists proudly announce their ambitions to continue that trend, until Dar al-Harb becomes Dar as Salam and the world belongs to Allah. Anonymous should read a few more history books before making snide comments designed to instil a sense of Western guilt, while giving Islam a free pass. It’s high time we refused to fall for these shoddy tricks while Islam goes unchallenged. European empires may not have been a good thing but they ensured a stability in the world unknown since their disappearance. And the gentleman is right about Europeans being few in number. At the height of the Raj there were 30,000 British in India in a country of hundreds of millions. They could have massacred us if they wanted but of course the maharajahs were on the British side. Also, most of these countries have been independent for 50 to 60 years and Britain is still sending them hundreds of millions of pounds in aid even to India and Pakistan. So we do still feel responsible for them in the light of our imperial adventures. Finally, of course, if we were so odious then why the hell do they want to come to Europe and push the Europeans aside. Surely, if we wre so odious they would want nothing more to do with us. They need us still the way they needed us when we were running their countries in an orderly and peaceful fashion.